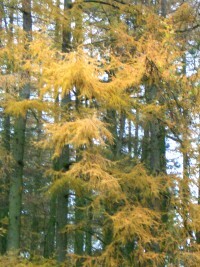 The Larch is deciduous, unlike most other conifers. 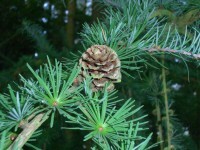 The needles are bright green, soft and grow in tufts along the branch. They turn yellow before dropping in the autumn. 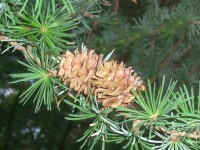 The fruit is in the form of woody cones which grow along the branches. Larch wood is high quality with a reddish grain and is used in houses and ship-building.